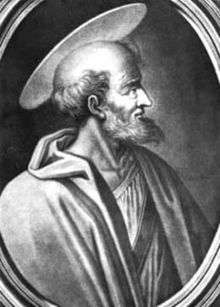 According to Richards, "the death of Pope Symmachus in July 514 was a crucial test for the election regulations after nearly sixteen controversial years of Symmachian rule." However, the "Symmachian old guard" controlled a supermajority of the priests and deacons and thus were able to elect Pope Hormisdas (514-523) after only seven days. Hormisdas was likely appointed by Symmachus himself, "a procedure which was implicit in the electoral regulations." Hormisdas had prepared complicated written instructions for his envoys to the East long before his election and kept Theodoric well appraised of his negotiations with the Byzantines. ↑ Howroth, 1913, p. 406. ↑ Herbermann, Charles, ed. (1913). "Ostrogoths". Catholic Encyclopedia. New York: Robert Appleton Company. ↑ Richards, 1979, p. 57. ↑ Richards, 1979, p. 58. 1 2 3 DeCormenin and de Lahaye, 1857, p. 98. ↑ Herbermann, Charles, ed. (1913). 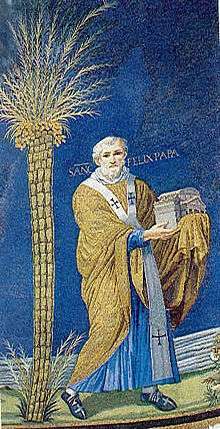 "Pope St. Symmachus (498-514)". Catholic Encyclopedia. New York: Robert Appleton Company. 1 2 3 Richards, 1979, p. 70. 1 2 3 4 5 Baumgartner, 2003, p. 9. ↑ Richards, 1979, p. 79. ↑ Richards, 1979, p. 77. 1 2 3 4 Richards, 1979, p. 71. ↑ Richards, 1979, pp. 71-73. ↑ Richards, 1979, pp. 77-78. ↑ Richards, 1979, p. 78. ↑ Richards, 1979, p. 73. 1 2 3 4 Richards, 1979, p. 100. 1 2 3 4 Richards, 1979, p. 111. ↑ Society for the Diffusion of Useful Knowledge. 1842. Penny cyclopaedia of the Society for the Diffusion of Useful Knowledge. C. Knight. p. 320. ↑ Holland, David. 1989. The Encyclopedia Americana. Grolier Incorporated. ISBN 0-7172-0120-1. p. 87. 1 2 3 Baumgartner, 2003, p. 10. ↑ Coulombe, 2003, p. 96. ↑ Evans, James Allan Stewart. 2002. The Empress Theodora: Partner of Justinian. University of Texas Press. ISBN 0-292-72105-6. p. 65. ↑ Coulombe, 2003, p. 99. 1 2 3 4 Richards, 1979, p. 141.